After applying a little editing polish to photographs with image editors, you can also showcase your pictures with slideshow software. Slideshow, otherwise presentation, software enables users to display an image collection within a single slideshow so that they don’t need to open each photo separately. With those applications, you can set up photo presentations with some dazzling extra effects, animations, music and subtitle captions that provide extra image details. This is some of the best Windows 10 slideshow software. Icecream Slideshow Maker is a powerful program which allows you to create slideshow presentations with photos and music. It has an intuitive interface, simple controls, attractive design, but also advanced options allowing to create high-quality slideshows with minimal effort. The program handles photos in JPG, JPEG, PNG, and TIFF formats and also supports audio files in MP3, WAV, and WMA. The user can add an audio track to complete the impression and even configure the offset and fade values for audio. User can control each photo in the slideshow by choosing the desired time of displaying, and also type and duration of transition effects. Besides, you can scale the image to fit the screen or keep its original aspect ratio. There are more than 20 transition effects to choose from, such as Pixelate, Mosaic Spiral, Wipe, Zoom. The program comes with an in-built media player which you can use to check the effects prior to applying them and preview the project before creating a slideshow. Icecream Slideshow Maker features a special YouTube button that allows you to upload the presentation to your YouTube channel instantly. So, the program is stuffed with useful features and all of them are easy to comprehend and use due to the intuitive interface and perfect logic behind the options. Considering that, Icecream Slideshow Maker appears to be a priceless tool for both advanced and novice users. PhotoStory Deluxe has a rich tool set for photo slideshow design with which you can set up HD (high-definition) presentations. This application has just one version, which is available at $39.99 on the publisher’s website. 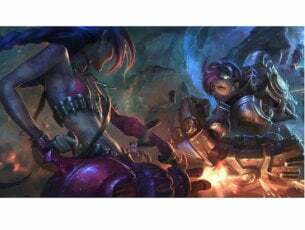 Its platform compatibility is limited to 64-bit Windows 10, 8 and 7. So that excludes 32-bit versions of Windows. PhotoStory Deluxe probably has the most extensive set of editing tools you’ll find in a presentation application. Firstly, it has 250 slideshow transitions; and they include HD and 3D transition effects. It gives you 132 backgrounds and themes to choose from that include further decorative elements. The software also has some great animation options such as its travel route animations that enables you to display photos within a route display. PhotoStory Deluxe even has its own full photo and music-editing programs. With its music editor you can mix up to seven background tracks into a single presentation, and the software provides you with 750 audio files for the slideshow. On top of that, PhotoStory has terrific photo-editing tools with which users can apply HDR effects, secondary color correction, customize contrast and fix red-eye. This application supports a lot of media outputs as you can burn the photo slideshows to DVD and Blu-ray and transfer them to mobiles, TVs and tablets. PhotoStory enables users to export presentations to 10 video and two image formats, and the output can be in 4K resolution or even 3D. You can also upload the presentations to YouTube, Facebook and Flickr and share them via email. PowerPoint 2016 is the MS Office suite’s slideshow software, so this is one of the market-leading presentation applications for Windows 10. 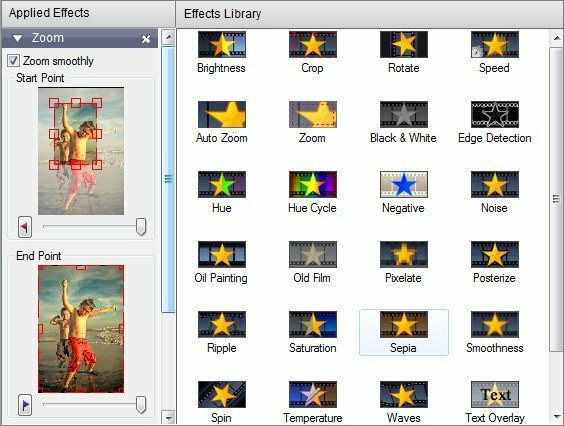 This application has almost all the editing tools you’ll need for setting up eye-popping photo slideshows. It’s compatible with Windows platforms from Windows 7 up. In addition, you can also add a PowerPoint Mobile app to the Windows 10 Mobile, Android and iOS platforms, which is more specifically designed for phones and tablets. The desktop version retails at $109.99, which isn’t entirely the best value, but PowerPoint Mobile is freely available. 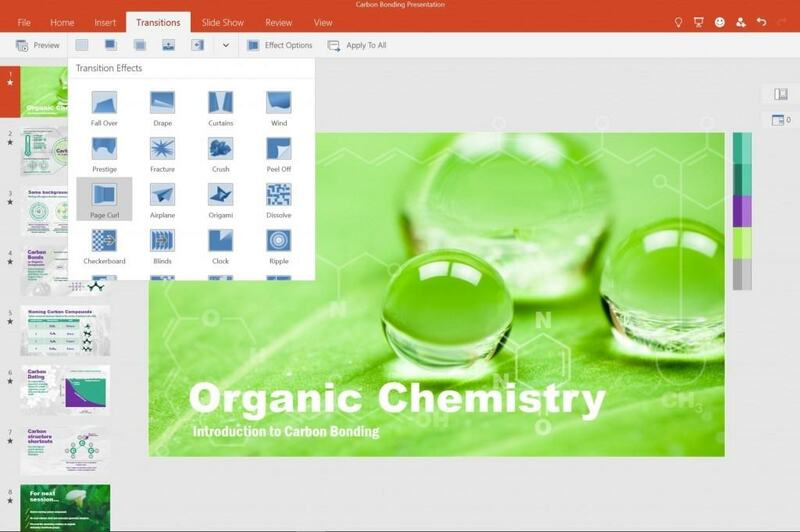 PowerPoint boasts an impressive set of editing and creative tools for presentations. 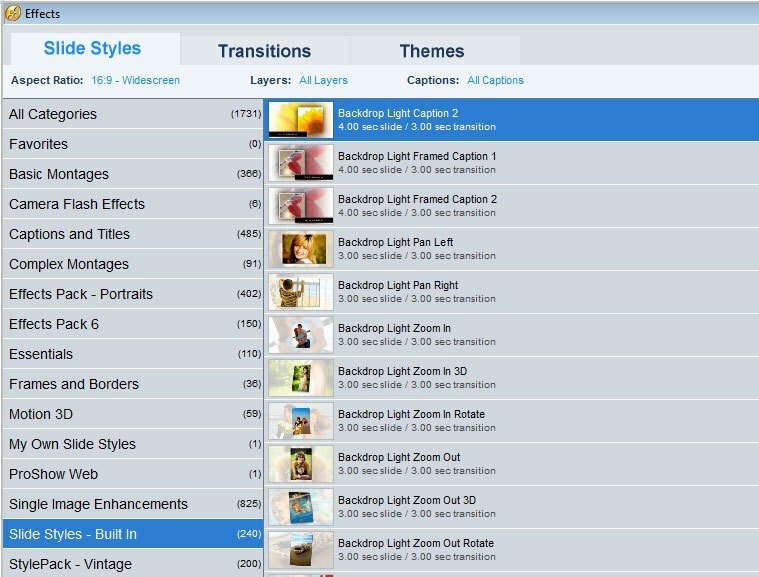 Users can select from 50 transition effects and 26 backgrounds and themes for their slideshows. Furthermore, the application also has some great animation options that enable users to apply motion paths to photos, text and clip art for much more dynamic slideshows. Voice narration is a more unique PowerPoint tool with which users can add voice narrative to the slideshow as an alternative to subtitle text. Another good thing about PowerPoint is that it also includes some photo-editing options so that you can enhance the photos within the application. PowerPoint supports only DVD, HD, widescreen and QuickTime output formats, which is somewhat limited compared with alternative applications; but few other presentation programs can match its wide array of editing tools. PowerPoint be all the better when Microsoft add the 3D tool, for inserting 3D images and animations into presentations, to the software in 2017. ProShow Gold is a highly rated photo slideshow application that pretty much gives users the full suite of editing tools, supports all the main output formats and has extensive photo-sharing options. The software has a Gold, Producer and Web version, which enables you to set up photo slideshows online with your mobile. Producer is a more video-orientated version of ProShow. ProShow Gold 8.0 is retailing at $69.95 on the Photodex website. Also note that there are various StylePack and Effects packs for ProShow that expand the software’s transitions, animations and other effects. ProShow Gold boasts a whopping 427 transition effects, which might be more than any other alternative application. Although its choice of backgrounds and themes is more limited, you can set up presentations with any number of images. Users can add clip art, video clips, animations, subtitles and background audio to their presentations. Furthermore, the software includes a wizard that automatically creates the slideshows for you. ProShow Gold also includes some handy image-editing options such as red-eye removal, black and white and a cropping tool. 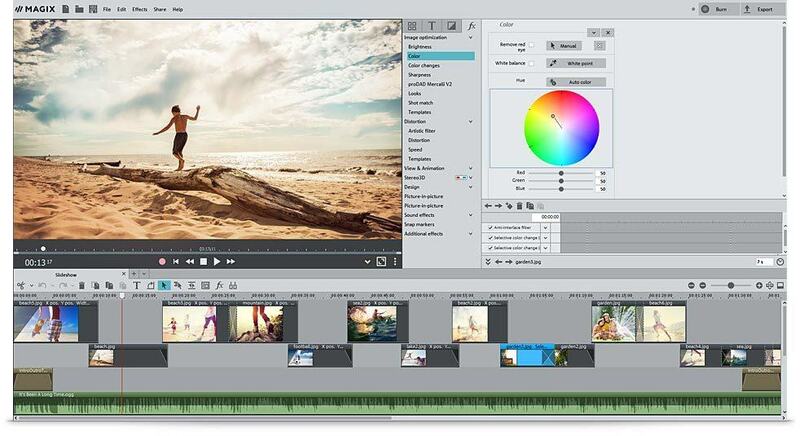 ProShow certainly doesn’t lack any editing tools, and it supports a variety of output formats. With the application, you can create slideshows for DVD, Windows Media, MPEG-2, widescreen, CD, AVI and MPEG-4 output formats. The software also enables users to share presentations via YouTube, mobiles, email and Twitter. Overall, ProShow Gold has raised the bar for slideshow software. 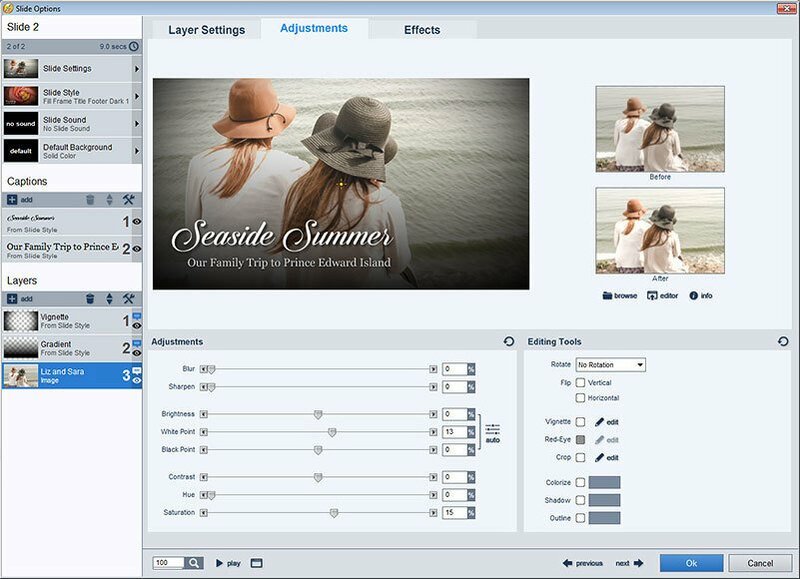 PhotoStage is slideshow software with a pretty good range of editing tools, extensive output support and an efficient UI. It has Home and Pro editions that are much the same, except the Pro version also enables you to insert video clips into presentations. PhotoStage Pro is currently retailing at a discounted $34.99, but is usually available for $70. 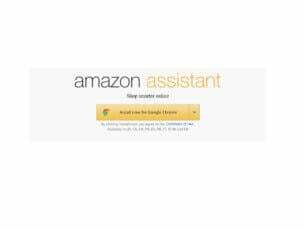 The application is compatible with Windows platforms from XP up, Mac OS X, iOS and Android. This software has an intuitive UI design that’s straightforward to navigate and smooth drag-and-drop positioning for pictures. 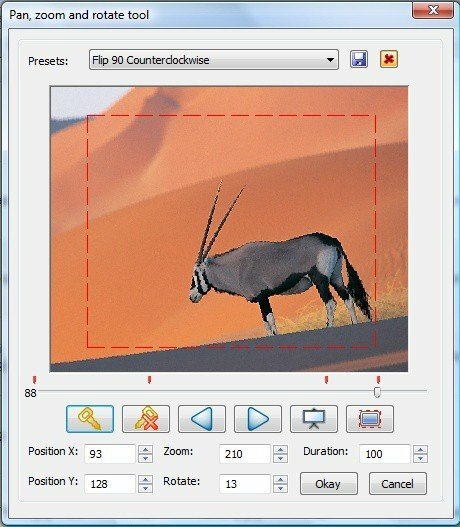 Although lacking animation tools and backgrounds & themes for slideshows, PhotoStage users can still add clip art, video clips (in Pro version), music tracks, subtitle text and even voice narration to presentations. Furthermore, it gives you 35 transition effects for slideshows, which might seem a little limited compared with ProShow; but that’s still a reasonable selection. PhotoStage also has great photo-editing options with which you can optimize photo colors, adjust saturation, crop, rotate, pixilate and apply other effects to images. PhotoStage’s output support outshines most alternative applications. 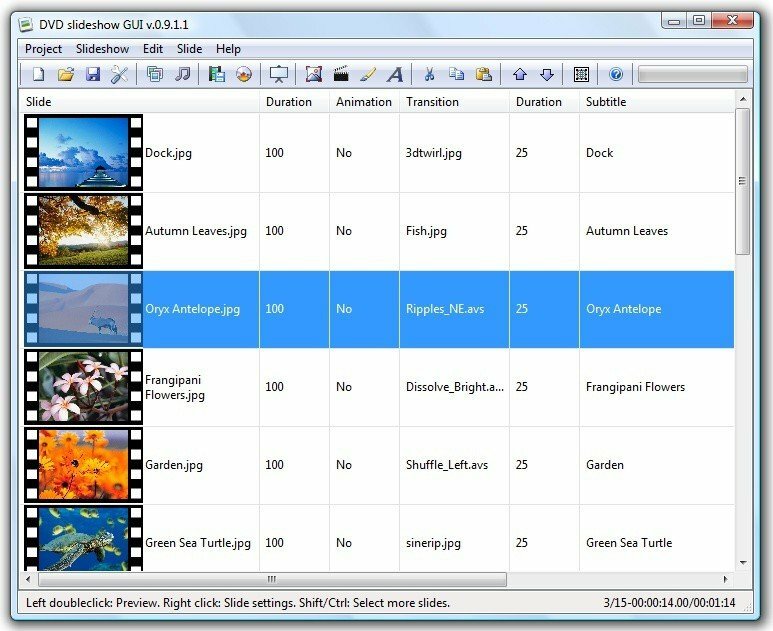 Users can export their slideshows to DVD, CD, HD-DVD and Blue-ray and transfer them to MPEG-2, MPEG-4, AVI, Windows Media and Quicktime formats. The application also enables you to upload the presentations directly to YouTube and save them to iPhone, PSP and 3GP mobiles. DVD Slideshow GUI is presentation software that enables users to create photo slideshows and burn them to DVD and Blu-ray or export them to various video formats. So this would be a good choice if you need to add the slideshow to DVD. The best thing about DVD Slideshow GUI is that its open-source software you can add to Windows from this web page. Note that this software is a user interface front end that packages tools such as a Dvauthor, Demux, Videohelp, Flvtool2 and ImgBurn in its installer. DVD Slideshow GUI gives you 245 transitions and 100 other effects to spruce up slideshows with; and this page includes previews of the transition effects. That’s an excellent selection, and users can also add motion backgrounds and image animations to presentations. It offers a little more flexibility than alternative slideshow software as you can also create transitions and motion backgrounds. In addition, the application enables users to add multiple background music and subtitles, with extra effects, to presentations. 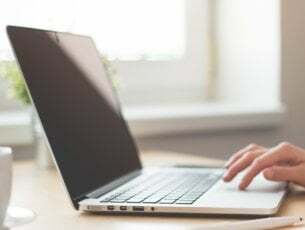 When you’re all done with editing the presentation, you can then burn the slideshow to DVD video or Blu-ray, DVD chapters, DVD audio or DVD chapters. Furthermore, with this application you can set up DVDs with menus that include multiple video or photo slideshows. You can also export the presentations to a range of video and audio file formats among which are MP4, MP2, MPG, AVI and AC3. Those are five of the best presentation applications for Windows 10 to showcase photographs with. With them you can set up photo slideshows with a variety of transition effects, backgrounds and themes, animations, additional clip art, subtitle narratives and background music. Then you can add the slideshows to numerous media output formats on DVD, Blu-ray and CD or share them via YouTube, Twitter, email, etc.